Ellie lives with her grandparents on Spit Farm. Theirs is a simple farming life, full of love. When her dying grandfather plays a magical button box, her whole world begins to change. The green promises of the box soon devolve into drought and sickness. There are secrets too and Ellie can see only one way to make things right – she must take the button box back to where it came from. She sets out to a place she knows only from stories and dreams, taking with her Nanny, a goat, and a horse, Sol. The world is a dangerous place and Ellie has to work out who to trust, who to stay well away from. Julie Hunt writes award-winning stories that are a little bit magic, very real, and full of wonderous characters traversing almost recognisable landscapes. In ‘Shine Mountain’, Ellie is loyal and loving, reckless and brave, innocent and unexpectedly knowing. In her journey to Gleam Mountain, she encounters others who seem to know more than she knows herself. 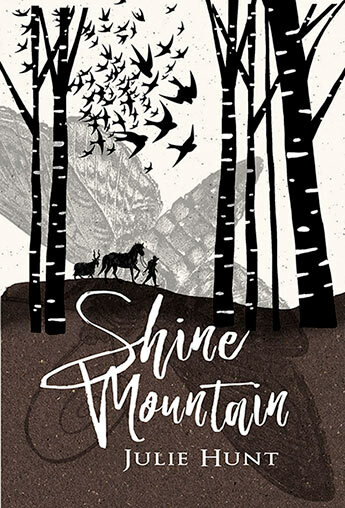 ‘Shine Mountain’ is an unputdownable novel for mid- to upper-primary readers.